It's high time RE takes some proactive action to diffuse the situation. 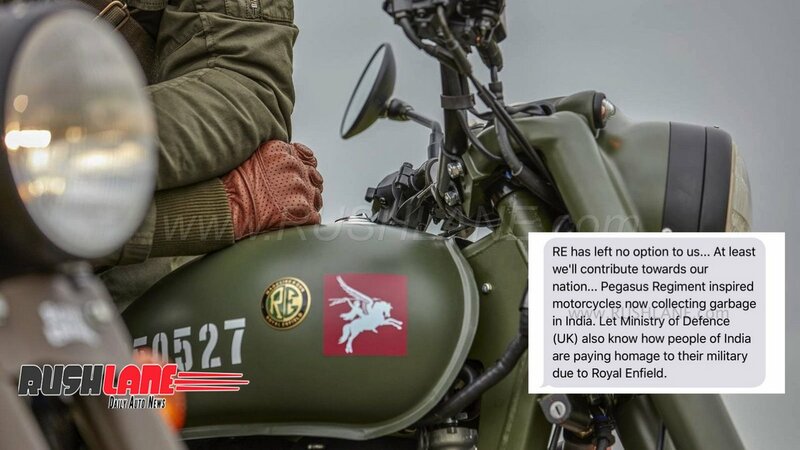 Responding to the open letters filed by a couple of Royal Enfield Pegasus 500 Limited Edition owners, the motorcycle maker has made a feeble attempt at solving the situation. To recap the story in short, RE launched Pegasus 500 Limited Edition model based on the Classic 500 with some unique features to pay homage to the British Army and the two wheeler brand’s involvement in WWII. The company charged a premium of Rs 2.65 lakhs (on-road, Kochi) for the uniqueness of the limited edition model of which only 250 units were allotted for India (limited to 1,000 units across the globe). However, even before the 250 units allotted for India reached the customers who were lucky enough to complete the heavily contested online booking, the company went ahead and launched Classic Signals 350 which includes almost every unique features of the Pegasus (no longer unique) in addition to dual-channel ABS. We, Pegasus Owners are very frustrated with the launch of RE Signals. Even a small child can tell that the design has been copied. But, the high qualified staff at Royal Enfield is unable to admit that. They are very adamant about it. 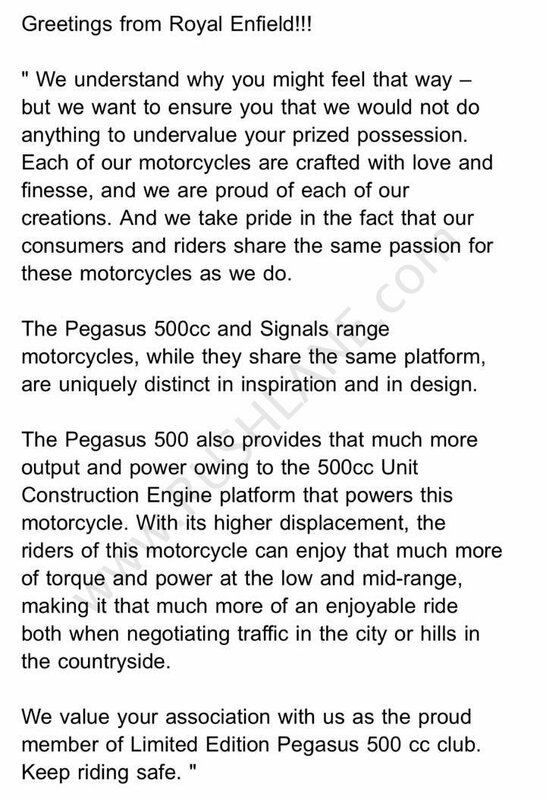 They are just concentrating on increasing the sales of their bikes keeping their brand value & respect of Pegasus owners at stake. From past 3-4 days, we are in touch with the staff of RE but getting no answers from them. Not even top auto websites aren’t publishing article about this injustice done to Pegasus owners. RE is a very big company & we’re just 250. How we are going to fight with them? So, we’ve collectively taken a decision. And this is the only way left to us. We’ve decided that if RE Signals is delivered to customers with this same design (with stenciled serial nos. & positioning of 2 logos at the front of fuel tank), we all will DONATE our Pegasus to the respective Municipalities of our respective cities & we will contribute to Swachh Bharat Abhiyaan. If company doesn’t keep value of their prestigious customers, we too will not keep the value of their most hyped bike. Clearly it is seen that they have used us as bait to increase their sales. If they are adamant about their pride, we too are very adamant about our decision. Charging a premium with a promise of exclusivity and then shattering that promise almost immediately will not be taken lightly by the loyal customers. It’s high time Royal Enfield takes some proactive action to address the genuine concerns of the Pegasus owners. The least the company can do is retrofit the Pegasus with dual-channel ABS at no additional cost (the international version of Pegasus offers ABS).